The Client Questionnaire form allows us to collect detailed information about your website design project. As you will see, the form is rather extensive, and in most cases, you will not have all of the information readily available to answer many of the questions. So, I am also providing the form in paper format so that you may print it out and collect all the information you will need to answer the questions. I will leave it up to you as to whether you want to email me a copy of your completed paper form or fill out the form online using the information on the printed form. Or, they are searching with their mobile phone/computer. Or, they are in their car using a GPS navigation system. You just never know when, how or where someone is searching for you. The only thing you can be assured of is that they are searching and you need to make it as simple as possible for them to find you. If you do not submit a uniform public business profile across all search mediums, the information that people do find about your business could be incomplete, incorrect, or nonexistent. Over 90% of businesses are not found on one or more of the local search and map websites because they have not submitted a uniform business profile. If you want your business message to be found, regardless of where the customer might be searching, you need to submit a public business profile on all search mediums. The business profile form we are asking you to complete answers all of the key questions asked by more than 120 local business search directories. By answering every question on the form, you are guaranteed to be 100% ready to submit your information to these local business search directories. Discover the best marketing tools on the net as an AdlandPro Gold Member. 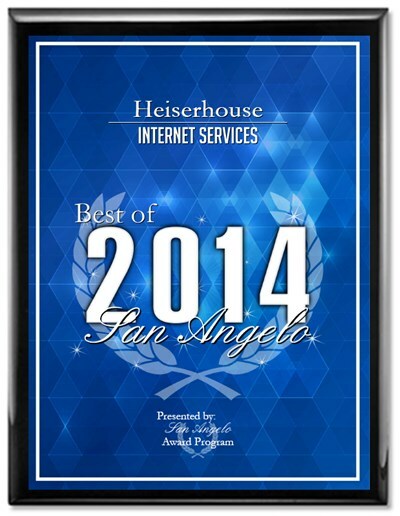 HeiserHouse receives the prestigious 2014 Best of San Angelo Award for Internet Services for the second year in a row.